Wonder Woman looks amazing as a World War II bomber art-style pinup. She can do it, alright. She Can Do It! If anyone can get the job done, it's Wonder Woman! As this World War II bomber art-style print shows, Wonder Woman is up to any challenge. 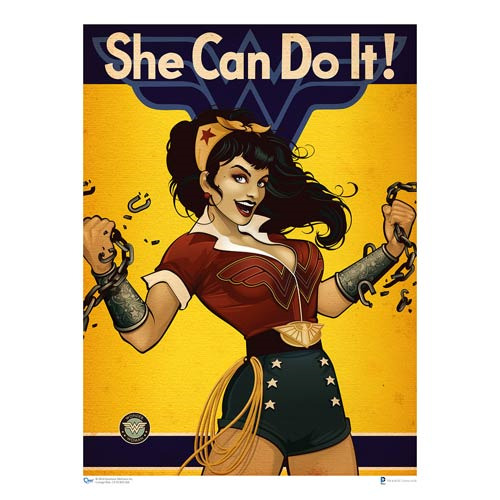 Dressed in a retro-style version of her famous uniform, this DC Bombshells Art Print depicts the Amazonian princess breaking the chains of tyranny without breaking a sweat. The DC Bombshells Wonder Woman Art Print measures 24-inches tall x 18-inches wide and is printed on 100-pound, satin-finish paper. Note: Product ships rolled. Ages 14 and up.